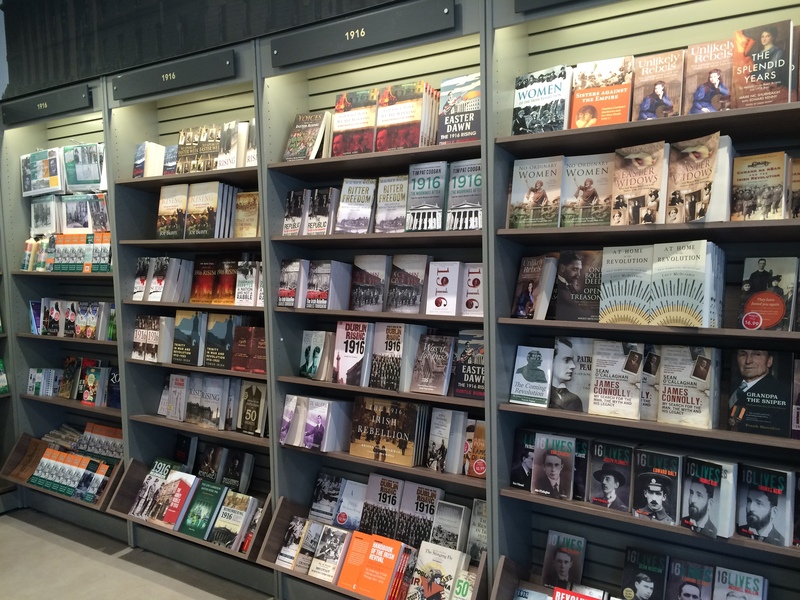 DUBLIN~In December, I filed this post about the number of new books and reissued titles being published for the 1916 Easter Rising centennial. Below is a look at the shelves in Eason & Son on O’Connell Street next to the General Post Office, epicenter of the rebellion. The Dublin bookseller since 1819 closed during the week-long outbreak of violence, but employees still got paid, according to an exhibit inside the store. Nearby, what seems like 1,916 books about 1916 line the shelves. There are only 252 titles in the inventory, according to the store’s online catalog. UPDATE: The original mid July 2016 link on the words “online catalog” expired. A late March 2018 search for “1916” returned 100 results, many at 25 percent discounts. More than half the 1916 stock has disappeared. This entry was posted in Arts & Culture, History and tagged dublin, Eason, O'Connell Street on July 20, 2016 by admin.